Turn off Blue Peter and grab your Nun’s Knicker’s, it’s time to get bloody serious about video on the Canon 7D. Philip Bloom is an international director/filmmaker who has jumped on the Canon bandwagon. Starting with the Canon 5D Mark II, Philip has now incorporated the Canon 7D and the new Canon 1D Mark IV into his productions. 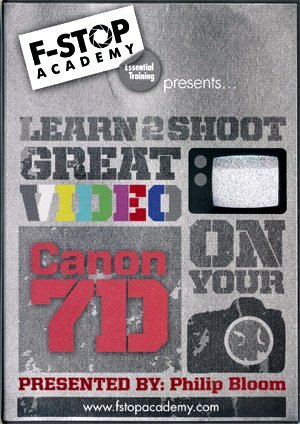 Philip just released a new tutorial DVD, Learn 2 Shoot Great Video on Canon 7D. It is a wonderful insight into professional cinematography using a dSLR. Philip brings his extensive expertise and provides you the basics for shooting video like selecting your gear, lenses and shooting a scene. This is the ONLY reference that is actually dedicated to shooting video on the Canon 7D and it is very insightful. The overall tutorial is a pleasure to watch and very informative. The video is available as either a DVD or as a download direct from Philip Bloom’s Fstopacademy.com. I ordered the DVD and received in within a week. The regular price is $175, but it is on sale for $135. Best yet, if you look here there is a discount code for an additional 20% off. The behind-the-scenes of the following video are included as part of the instruction on the DVD. Thanks for the review. What killer tips did you learn from Bloom’s video that you didn’t know before? Well, I don’t think it would be fair to Philip to go into any greater detail than I already have. If I did, then you would not need to buy the video. I did enjoy it and recommend it for anyone interested in shooting video with the Canon 7D. Be sure to click the link for the discount code. I will tell you that I am going to start experimenting with time-lapse video because of this DVD.